It's a bleaching process that lightens discolorations of enamel and dentin. The system uses a mild solution retained in a custom-fitted tray that is worn over your teeth. The whitening gel is a thick solution, that is dispensed to patients by a dentist. 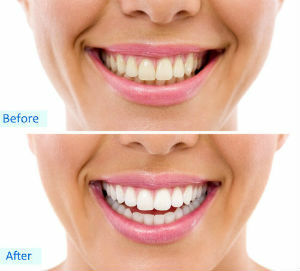 The whitening gel is placed in a thin bleaching tray that fits over your teeth. As the active ingredient in the gel, carbamide peroxide, is broken down, oxygen enters the enamel and dentin and bleaches the colored teeth. The structure of the tooth is not changed; only the tooth color is made lighter. It is always performed by a dental professional, so you can be assured that the procedure is safe. This is a one-visit procedure that the dentist will perform. Rather than having to wear a mouth tray for one or two weeks to see results, you will see results immediately. Safe and effective one-hour, in-office bleaching might be the right choice for you. If you have any questions about your whitening options, please consult with us.